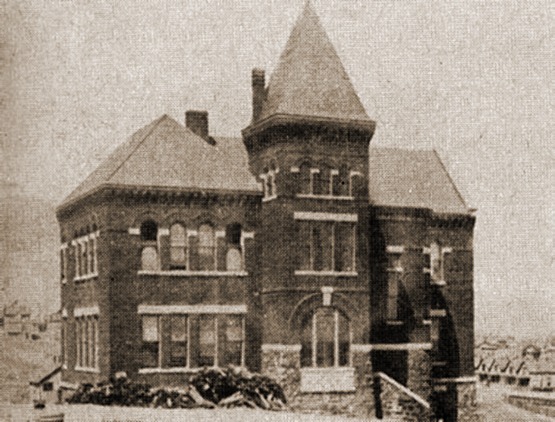 The red brick "Old Jeff" elementary school, on the northwest corner of Highland and Dakota, was built in 1891, and was used for Baby Boom student overflow even after the adjacent frame and stucco "New Jeff" was opened in 1949. 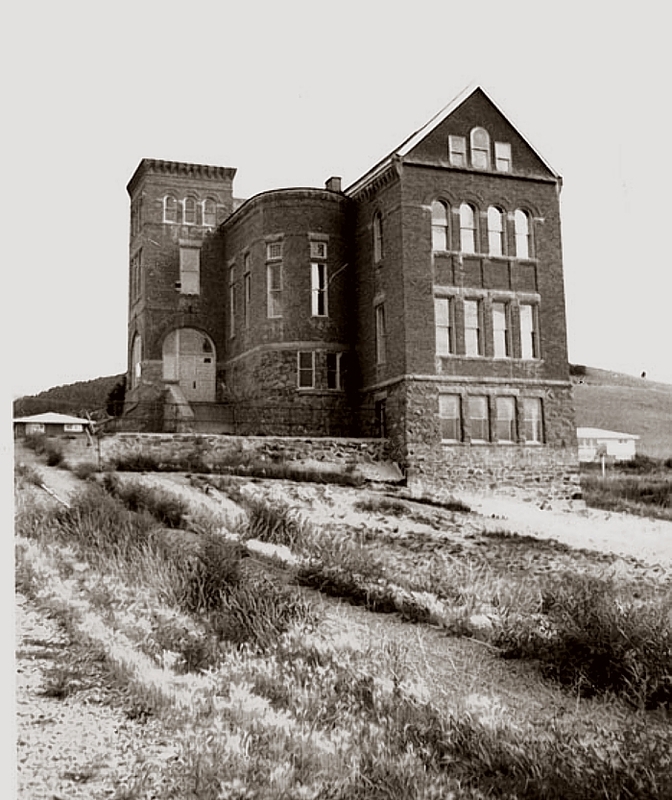 The old building was demolished in 1971. 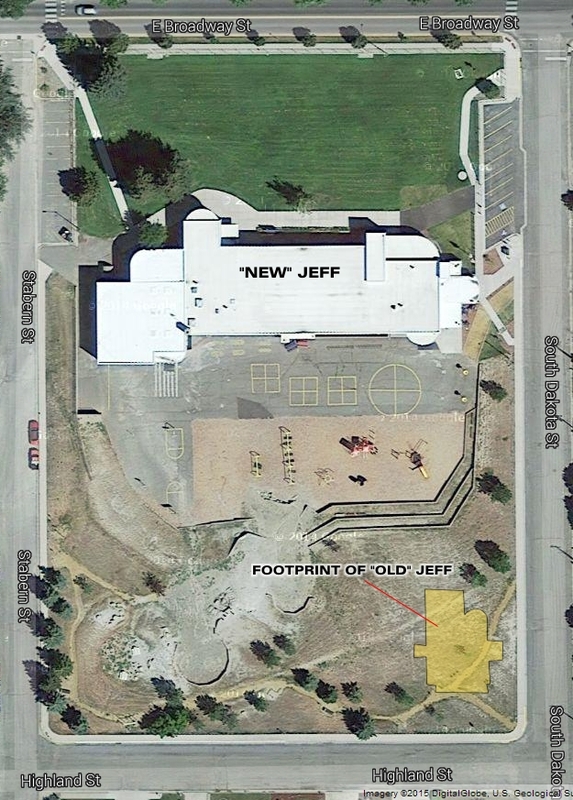 The footprint of the old Jefferson School superimposed on a recent satellite view of the campus. CLICK ON PHOTO FOR A LARGER VERSION IN A NEW WINDOW. 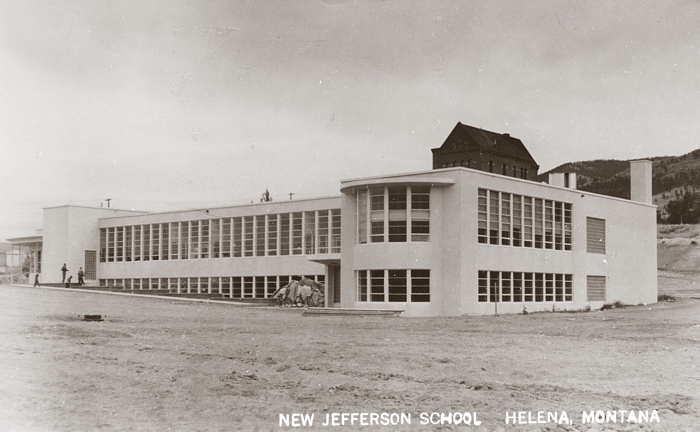 Opened in 1949, the new Jefferson School boasted ramps instead of stairs, air conditioning, varying classroom color schemes (warm colors on the north side, cool colors on the south), tinted windows, recessed fluorescent lighting, lockers in the central corridor, movable desks and chairs, and an "activity alcove" in each classroom. 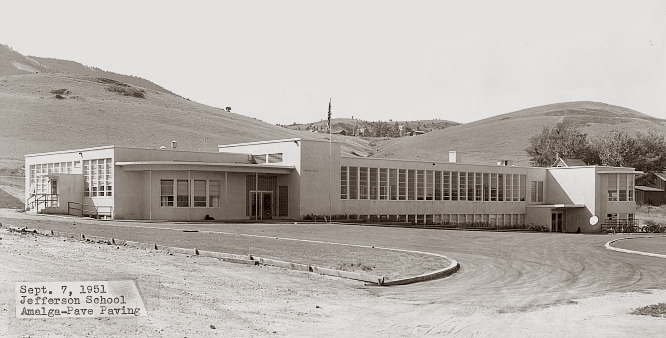 The building was designed by Kalispell, Montana architect Fred A. Brinkman (1883-1970), who also designed Helena's new Broadwater School at 900 Hollins Ave., which likewise opened in 1949. McKinnon-Decker of Helena was the general contractor. from 1958-60, Remembers Old Jeff. "Old Jeff was remarkable in that it was one of the few tall brick buildings that survived the 1935 earthquake intact. Another feature which none of the students will ever forget is the enclosed three-story spiral fire escape slide mounted to the outside of the building, which on rare occasions (at least annually) students were able to enjoy. It was a joy to ride down, one of the few vivid memories I retain of early elementary school. "That and the old wooden desks and creaky floors in Old Jeff; it oozed 19th century charm and you felt like it was a special place, though a bit spooky. Also, in the winter climbing up and down "the hill" without sliding down or slipping was a challenge, particularly if it got icy. "They don't build them like that any more. Shame."